Flat roofs are horizontal or near horizontal and are otherwise known as low-pitch roofs. A waterproof material is used and water is allowed to run off the roof area at a slight inclination into a gutter system. Although some flat surfaces won’t have a gutter system attached, they’re highly recommended and will keep the walls and foundations dry. Flat roof benefits are becoming more evident around the country. For those that invest in a flat roof, not only are they a space saver but the economical and efficient structure ensures both energy and money are saved too. 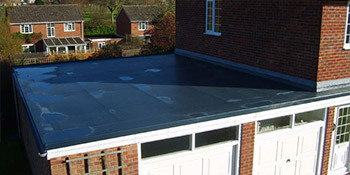 On top of this, flat roofs tend to last longer than the pitched tops and are also cheaper to have installed. They’re also resistant to UV rays and changing weather conditions, whilst they can be combined with almost any material. Flat roofs prove to have a number of benefits for homeowners and commercial properties. If you’re interested in a flat roof for your building you’ve come to the right place. Just complete our quick form and receive up to four FREE quotes from vetted, local and reputable professionals. Project: Remove old felt flat roof on shed, replace with fibre glass roof new osb boards etc, size is 360x190cm. Project: Re-roofing of 2 stable blocks. Project: 12m x 3m plastic coated corrugated sheet's. Project: GRP conservatory roof [5m x 2m] to replace old felted roof which has begun to leak. The PVC window frames and door were replaced only a few years ago. Project: Garage roof repair, at my mother's property, as there is a leak. It is an asphalt type roof. Project: EPDM insulated flat roof to be laid on top of 18mm shuttering ply, on single storey roof about 2.8 X 2.6M. Prompt response and quoted and completed to my satisfaction. Saved me ringing around looking for companies to do the job. Put me in contact with businesses that could complete the job as needed. it helped me to decide which company to spend my money with. Properties are given an energy score dependent on exactly how efficient they are and ratings are displayed in the data underneath. This varies from A, by far the most energy efficient, to G, the very least efficient. With a higher rating you're more likely to have cheaper energy bills as more heat will be kept inside your home. You'll be able to increase your home's efficiency with insulation including upvc double glazing, loft lagging or wall cavity insulation. The data underneath indicates the various types of properties within Uk. Essentially the most common properties around the UK are detached and semi-detached properties. Other kinds of homes consist of terraced houses, flats, converted flats and bungalows. The pie chart below reveals the portion of homes within Uk which are central heated and non-central heated. Central heating figures within the majority of UK houses, such as those on the gas grid and homes heated by oil and electric. The data underneath reveals the spread of homes heated up by different fuels. Around the United Kingdom the most frequent undoubtedly are gas heated houses, followed by electricity and then oil. Biomass central heating boilers are also growing in popularity, heated by sustainable products like wood pellets or agricultural waste.|Properties in the UK are warmed by a number of fuels, such as gas, electricity, oil, solid fuel and LPG boilers. Each fuel has a varying cost associated with it and that means you could find yourself with more affordable energy bills by changing the way your household is heated. Even solar thermal panels are being considered by many people as a way to lower heating bills for the many years to come.